There have been some very interesting 2x8mm small format film camera designs. Because this film format had the necessary time to mature, there are some examples which rightly earned recognition for „pointing the way.“ Consider the Carena models which moved the heaviest component – the clockwork mechanism housing – to the lowest point, the handle. Or the Camex Celule Reflex, a compact camera with a guillotine suitter which allowed 100% of the light to reach the film or viewfinder – with real TTL light metering. One design from VEB Pentacon – the flagship of East German amateur film cameras – was often overlooked: a Double 8 cine camera with refined details which would credit any 16 mm professional cine camera. Admittedly, she does not have the regal style of a Carena or the feminine curves of a Beaulieu. Hence, with her finely ribbed powder blue coating, she comes across like a plump but clever aunt from the countryside. The greengrocers once joked, “A little chrome, a little paint and the Hanomag is ready” when referring to their favorite delivery vehicle, which was indispensable because of its reliability. It was the same in the 1960s as far as VEB Pentacon’s Pentaflex 8 was concerned, once it found its way into Western photo shops. As with all cine cameras, the lens sits at the front. An interchangeable lens with fixed or variable focal length was mounted on a clamp bayonet which was common to various East German sill cameras. Underneath was the control center, built like an engine-room telegraph: normal, single frame and run lock were signaled to the motor from here. It appears that father filmmaker sometimes wanted to appear in the frame as well. The textured screen hiding the photoelectric selenium element of the exposure meter sits proudly above the lens. Nearly all of the cameras on the market today that incorporate this technology have become blind over the decades. Care must be taken here if one still wishes to use a Pentaflex 8. There are no controls on the left side, only the plastic cover in powder blue and a film counter window. There is a bit more to see on the right side. The ASA/DIN film sensitivity knob is here, along with the “gearshift” which selects 8, 16, 24, 48 and 64 fps. It offers easy access to time-lapse photography with up to 4X slow motion. Also on the left, but invisible from the outside, is the governor that ensures steady shooting speed and winding of the spring mechanism. Its location is betrayed by the winding key. At the very front of the right side is an insignificant wheel similar to those used to regulate the volume on a Walkman. This controls the lens aperture. A coupling sleeve for a backwinding crank hides underneath a sliding door. Two thread sockets allow the connection of accessories. At the rear, we come upon the viewfinder eyepiece and the film chamber door with locking knob. There is no accessory shoe and no sound-recording connector, just a tripod thread on the base. A cine camera can indeed be built this simply. However, both the angel and the devil are in the details, but more about that later. One is greeted by yawning emptiness upon opening the film door. Is it possible that a missing cartridge goes here? A film cartridge for Double 8? Yes, the Lady In Blue offers a self-loading box into which the cameraman can insert a 7.5 m Double 8 film reel while relaxing at home in subdued light. With two or more, it is possible to prepare for a full shooting day in advance. The cartridge contains all the necessary film transport elements, a precise pressure plate to position the film properly in the film gate, a self-closing lightproof shutter and a film counter with forced stop after the first 7.5 meters. After shooting, simply pull the cartridge from the camera, flip it on its optical axis and reinsert it into the camera. The second side of the film is now ready to for exposure. Because the lightproof shutter closes automatically, this occurs professionally without fogging or film loss. We could stop here, if not for the fact that the interior can be partially inspected by removing the cartridge and shining a flashlight into the depths of the Pentaflex 8. Inside sits the film transport with the film gate and film claw. The claw mechanism is constructed extravagantly as a crank arm. The claw does not glide upwards behind the stationary film, as was typical of cheap equipment (and sometimes expensive equipment as well). Because the claw is completely disengaged from the film, the frame is held in place by the spring pressure plate and is almost bombproof. This offers good image sharpness. The left side must be removed for additional inspection. One can also unfasten two locking screws in the viewfinder and carefully unscrew it. Afterwards… oh, I shouldn’t describe it, because once opened, it is difficult to reassemble the “Lady” again. Upon removing the left side, one can easily open the cartridge chamber and clearly see the viewfinder tube which intersects the light path near the lens. The rotary shutter also lies here; the crown jewel of the camera’s design. A rotary mirror shutter is seldom seen in the 8mm world. It guides all of the light to the viewfinder as the film is pulled down. As soon as the film is stationary, the film claw is withdrawn and – astonishingly – another image window shines the light on the film gate. I call this a clean design! It follows that all of the parts must be tuned to function together as a precise team. This is valid with regard to sharpness and frame registration, and also for the viewfinder tube. Here, numerous adjustments can be carried out. The screws are fixed later with varnish-like protection. This is where the previously mentioned devil comes into play. Without the auxiliary equipment which once existed in service depots, a disassembled Pentaflex 8 is challenging to readjust. Without disassembling and opening the device, the speed is regulated by removing the leather cover at a certain spot. The governor is then adjusted with a watchmaker’s screwdriver. Of course, one will also need an oscilloscope, a photoelectric cell and a light source, as well as knowledge. This is not something for an amateur to tackle. The exposure meter is the second element of the Pentaflex 8 design that brings its genius into focus. It is photoelectric and therefore nothing special, if not for the inspiration to mechanically couple the aperture adjustment, film speed control and frame rate. This results in a sort of calculating machine that allows the user to calculate the correct lens aperture relative to the ambient brightness, the sensitivity of the film in the camera and the shooting frame rate. To understand this approach, imagine a chemist’s scale on which the light is placed in the left bowl. There is already a measurement: a lot of light = a high reading. Now place the lens aperture – ranging between 2.8 and 22 – in the right bowl. The pointer will return, and if it was the right screen it should be balanced in the middle. Eureka! We have the correct exposure. Now a difficulty arises if – in addition to the lens aperture – the film speed knob on the camera was changed. It becomes even more complicated if the frame rate control is changed. Both require a correction, because both of these processes work on the right side of our imaginary scale. Because only the light (which we cannot influence) is found on the left side, we much change the pointer in the viewfinder to its basic position as soon as the film speed and frame rate are changed. This requires an ingenious planetary gear which produces a meaningful coupling between the aperture, film speed and frame rate knobs. As long as no alterations are made to this mechanism, it should run for years. This is not the case with the selenium cell, which eventually fails due to natural aging and must be replaced with a cell which is electrically and physically the same to revive the exposure meter again. This might be possible with a bit of luck, otherwise we’re faced with design devil number two. Pentaflex 8 users who discovered how to get their equipment modified to Double Super 8 at at the right time were particularly lucky. 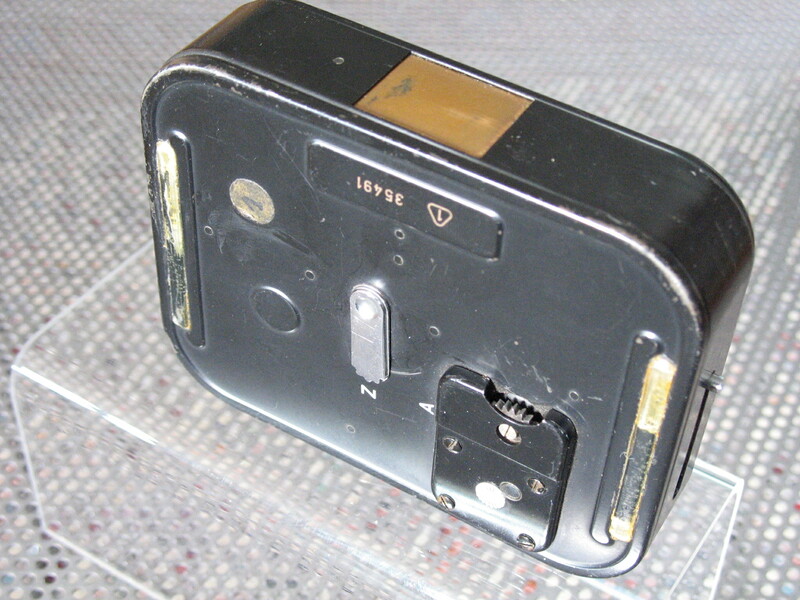 I held a Pentaflex S8 which even had a new aluminum front which proudly bears the inscription, “Super 8.” The image frame was changed acordingly, but the film grip arm was probably only modified at the tip, because Kodak’s recommended location of the transport mechanism in relationship to the image frame was not feasible. 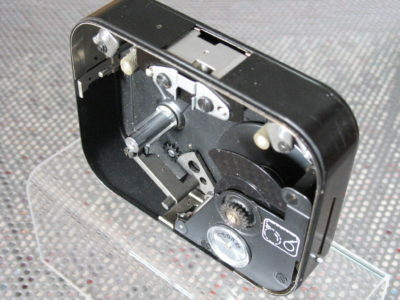 At least Double Super 8 film on 7.5 meter reels is still available today, if the lubricants in the spring and gears have not evaporated in the meantime and seized the camera mechanism. The reflecting shutter is often mistreated and spoiled by inappropriate cleaning techniques. Though this has no effect on the quality of the film footage, it ruins the high quality viewfinder image. 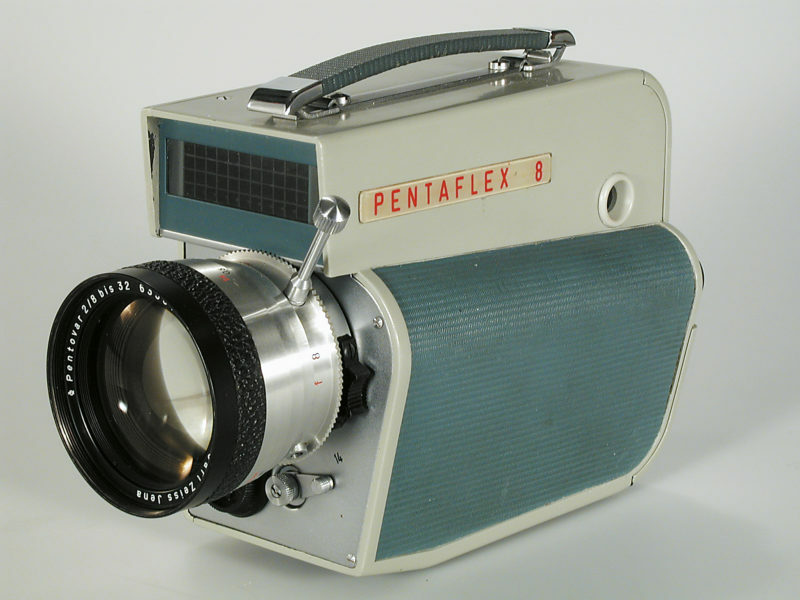 The Pentaflex 8 is a really nice cine camera that is difficult to restore, but worth keeping in a display cabinet because it is an engineering achievement worthy of recognition. The fact that it was not economically successful is closely tied to the commercial restrictions of socialism. Large numbers of this device could certainly have been sold throughout Europe, which would have ensured good service. The Blue Lady was always a top-quality product which did not have to hide behind the famous devices from Switzerland, Liechtenstein and France.